The 1969 20 Dollar Bill has value, mainly because it's an old bill that is no longer in circulation. 1969 was also the first year that the new treasury seal appeared on the 20. If your bill is in good condition then it's going to be worth more than its face value of $20. You rarely ever see an old $20 bill design anymore because the government has taken them out of circulation. The average lifespan for any US 20 dollar bill is only around 7 years. Whenever a bill gets old or worn out the government takes it out of circulation. Also the modern 20 dollar bills have additional security features that helps prevent counterfeits. The value of your bill will depend on a variety of different factors. The main factors are its condition and whether or not the bill is a 'star note'. A regular 1969 20 dollar bill in good condition is worth around $25. A star note in good condition is valued at around $50. A graded star note in great condition can go for over $100. To get an accurate picture of the current market, you can check the completed listings on eBay. If your bill has a star before or after the serial number then it's going to be more valuable. It's easy to see if you have a star note: Check the serial number. If you see a star instead of block letter then congratulations, your bill is more valuable. Check out the image below for an exmaple. These star notes are essentially replacement notes for damaged or misprinted currency, which makes them rare. Below are some factors that can affect the price of your bill, either positively or negatively. When determining value, the first aspect to consider is a bill's condition. The better the condition, the higher the value. So how do you judge condition? Ideally there should be no pen marks, stamps, or any other types of markings. There should also be no folds or creases. The image should be sharp and well-centered. If you think your bill is in near-perfect condition then you should consider having it graded. A currency note with a high grade is worth more money. 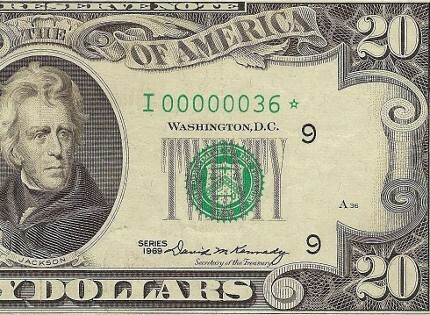 A low serial number indicates that it's one of the first bills to ever be printed in a series. An example would be A00000001A. A high serial number can be quite rare because typically the mint would just change to a new series rather than continuing to print the current series. An example would be F99999995G. Some collectors look for serial numbers with their exact birthday. The market for these numbers is more limited, but it only takes one person to pay a lot of money for a birthday serial number. An example would be B01251985F. This serial number would equate to the date of January 25th, 1985. Any serial number with an uncommon sequence has value. Some examples are ascending or descending sequences such as B12345678C or B87654321C. Another example is a block of solid numbers such as C55555555A. These uncommon sequences are very rare, so it's good to keep an eye out for them because of their value. This is definitely a nice bill to own. If you plan to buy one of these bills then make sure to buy from a reputable currency dealer. Remember that any valuable old currency will also be faked.